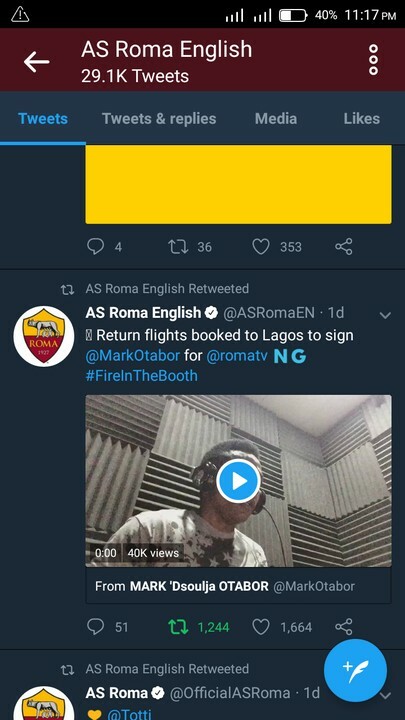 Seria A side AS Roma have reportedly invited Nigerian on air personality Mark ‘Dsoulja Otabor to Rome so they can sign him to RomaTV (Roma football fan TV) over his amazing commentary skills. The Seria A outfit took to their official Twitter handle to offer Otabor a job at RomaTv. As Roma hasn’t made to the semi finals in over 18years while made the astonishing comeback against Barcelona Historic. Otabor was in a fenzy mode on air when As Roma completed an astonishing comeback victory over favourites Barcelona in the Champions League and he was literally shouting in happiness during his live commentary program on the radio. Otabor who is a OAP on lagos MaxFM 102.3FM and Caster/Presenter on TVC News Nigeria(@tvcnewsng). As at the time of filing this reports friends and well wishes have stormed the Twitter handle of Otabor to congratulate him on his latest achievement. We wish him all this best.